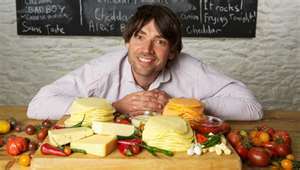 Oh Alex James, what has become of you? I remember when you were achingly cool and despite being more of an Albarn girl myself I could respect that you were hip and forged in the fires of awesomeness. Then you became addicted to cheese and we all worried as you turned your back on the hedonistic world of Brit Pop to dream up new fantastic types of cheese for us all to drool over. Well that's never going to happen now. Now I don't know if Mr James had a huge bill to pay, Perhaps had a lorryload of kumquats and potatoes coming for his next cheese invention and no way of paying for it but he wrote an article for The Sun newspaper basically extolling the virtues of fast food in a way that I never thought I would hear him or anyone else with a conscience do. Am I disappointed that Alex James has come across as a sell-out? Yes I am, the whole thing smacked of complete advertorial content. If I wrote a post like that, I would have to disclose that it was a sponsored post, (Sponsored by Greggs? Mmmmmmmmmmmmmm, call me) But no, Alex James has wrapped it up in a pretty bow and handed it to readers as a completely independent study into fast food. I'm off to listen to Parklife and wait for Gordon Ramsey to realise he has been unfavourable compared to a spread from Greggs. Can't imagine that's going to go down well. A bit like your cheese hey Alex? Was Alex James being honest in his article or do you think he may as well just get some Golden Arches tattoo'd on his arse and have done with it? 'mini babybellend' you are too funny! There I was thinking this was going to be about nanoblur lol. Will you be blogging about your evening with the bloggettes last night? Are McDonalds using his cheese or what? Eejit, he should get back to swaying around with his hair in his eyes and a fag hanging out of his mouth. So much more attractive than cheese! Think I lost all respect when he brought out Tomato Ketchup & Tikka Masala cheese - & I love "mini babybellend" am going to try & slip that into a conversation as soon as possible! I think he's a bit of a prat! Minibabybellend is inspired! This was so weird wasn't it? I remember reading it going what the hell is he thinking! ?